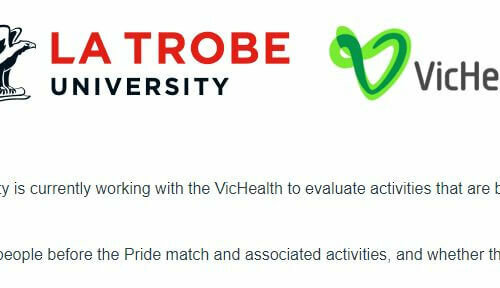 The Centre for Sport and Social Impact (CSSI) at La Trobe University is currently working with the VicHealth to evaluate activities that are being conducted that relate to football and the inclusion of the LGBTIQ communities. They are inviting you to participate in this research. This survey aims to understand the level of acceptance of LGBTIQ people before the Pride match and associated activities, and whether this changes as a result of the activities aimed at promoting inclusion and acceptance.